Help us make this event a success as we continue supporting the Semper Fi Outdoor Odyssey Kid’s Camp for children of wounded warriors in Onslow and Carteret Counties to attend camp and be mentored for a year. While Buffett’s daydream is of Havana, what are you daydreamin’ about? 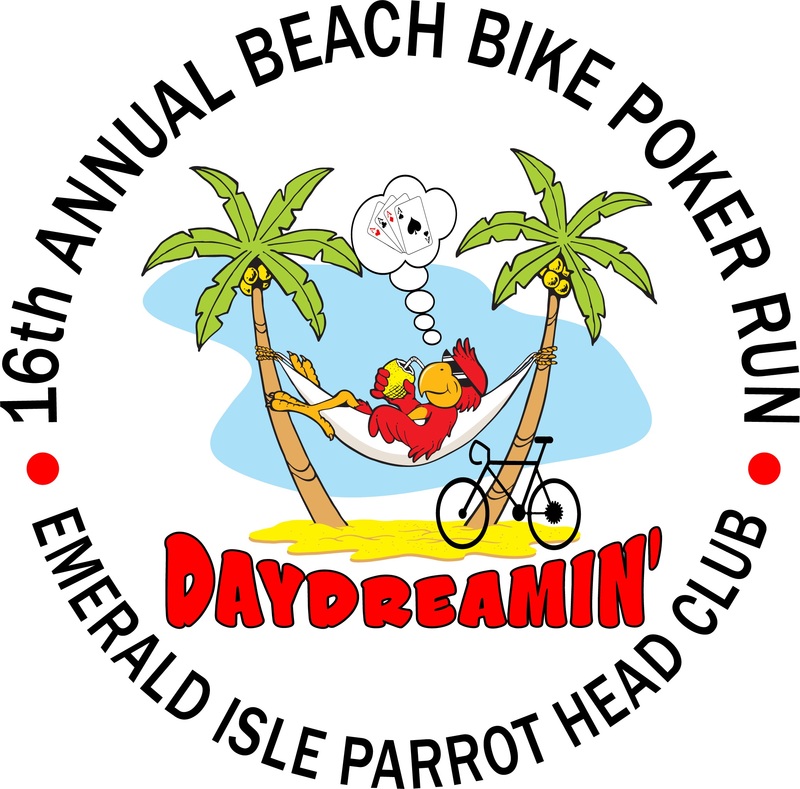 If its warm weather, cold drinks, poker playing, cash prizes or phun at the beach, our 16th Annual Beach Bike Poker Run has it all! Mark your calendar for Saturday, May 18, and join us for one of our most celebrated events. Starting at 12 noon you can pick up your registration packet or complete a same day registration for $25 at the Emerald Club. Even better, REGISTER HERE TODAY FOR $20 AND SAVE $5. Event t-shirts @ $10.00 each are also available online for purchasing, so register now to guarantee yourself the t-shirt size you want and to save money! Enter the Bicycle Decoration Competition, beginning at 1:30 p.m., by decorating your bike with any tropical/Buffett theme. The winners will receive CASH for 1st ($75), 2nd ($50) & 3rd ($25) place. Afterwards, riders will head to the 7 Poker Stops beginning at 2 p.m. to collect the best poker hand possible! These stops are Carolina Wine Mixer, Surf’s Up, Trading Post, Flipperz, Island Time Tavern, Shark’s Den and the Growler. You can also improve your hand with the purchase of a mulligan for $5! All card stops will close promptly at 5:00 p.m. You MUST have your hand turned in at the Emerald Club no later than 5:30 p.m. 1st place wins $300, 2nd wins $200 and 3rd takes home $100. Winners of the Poker hand will be announced shortly after 5:30. Prior to and following the race, please view our display of fantastic items and great packages contributed by local vendors to our Silent Auction. Place your bids and enjoy the opportunity to give and receive! (We take credit cards, so don’t be afraid to bid!!) Feeling lucky? As an added feature this year, we are raffling off a HUGE Board filled with Lottery tickets. Win the entire Board by purchasing raffle tickets. You can win $1,000’s! And don’t forget to purchase tickets for the 50/50 raffle to be sold prior to and following the race. You may register up to 5 individuals to attend and 1 t-shirt for each individual registered. All individuals registered must be over 21, as this event will include venues where alcohol is served. Note: online registration and payment are two separate processes. You will register, and then get a payment screen from PayPal. Your place is not reserved until you complete the payment step. Instructions I agree to participate in this competition under my own free will. I will be held personally responsible for my actions. I will conduct myself in a sportsman-like manner and will take responsibility for the behavior of myself, friends and family. I agree to abide by the rules, conditions and decisions of the Emerald Isle Parrot Head Club and its event officials. I accept the conditions under which this event is held, and accept all risks inherent in this competition – even those unforeseen by me. I agree to hold harmless the Emerald Isle Parrot Head Club, event sponsors, officials and volunteers from liability. I am accepting these risks on behalf of all individuals listed on this registration form. I agree to have fun and Party With a Purpose! By clicking the box below, I agree with the terms and conditions stated above, and I affirm that I am at least 21 years of age and all of the attendees I am registering are also at least 21 years of age. I agree with the terms and conditions above. Pre-registration is $20. Same-day registration is $25. Please select the appropriate payment options on the payment screen, displayed with registration confirmation for the number of registrants @ $20 each and t-shirts @ $10 each.